This is a beautiful villa located in fantastic viewpoint in Selva. It is modern, comfortable and surrounded by a stunning landscape. It has 250 m2 and capacity for 6 people. With wonderful views to the mountains, private pool and surrounded by peace, this beautiful country house located on the outskirts of selva can accommodate from 6 to 8 people. 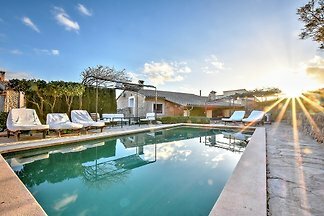 Located in Selva, at the foot of the Sierra de Tramuntana, this beautiful stone house with private pool offers a second home for 4 to 5 people. Idyllic little country house in Selva, with private pool and mountain views, for 2 people. Welcome to this beautiful and traditional stoned house in the heart of the picturesque village of Selva. This wonderful villa with private pool can be found in the charming village of Binibona, amidst the mountains and the fields. Magical Villa Can Pulit, situated in the heart of pinturesque town Selva - the entrance of the Unesco World Heritage Sierra de Tramuntana. This charming house is located in Selva, next to the Serra de Tramuntana and offers accommodation for 4 to 6 people. Rent successfully your holiday flat or holiday home in Selva in only 20 minutes !